Performance management systems track your employees’ performance, providing tools and strategies to help them improve. The best performance management systems increase employee engagement and support a culture of improvement. We looked at over 20 software options and chose the six that best covered the range of services for small business. AssessTEAM (Best Overall) performance management system for its balance of price and features. Zoho People Free for up to five employees; offers goal setting and 360-degree reviews. Small Improvements Companies that want customization and employee engagement. Performance Pro Legal checks and to tie performance ratings to employee compensation. Engagedly Robust employee engagement tools and integration with HR software like ADP; pricey. Lattice Companies from 20-200 employees that want integration with Slack and other apps. To evaluate performance management systems and software for small business, we focused on those that were easy to use for businesses that don’t have full-time dedicated HR staff to manage employee performance. The systems we compared are able to manage employee goals, conduct performance reviews, keep track of manager and peer feedback, and provide actionable reports. Some of the performance management software exceeds these requirements, such as providing HR functionality, org charts, a mobile app, single sign-on, or gamification. In fact, many of these extra features are why we chose AssessTEAM as our top recommendation for small business performance management systems. AssessTEAM is best overall for price and features. It can support any business that wants to conduct employee reviews. It takes a traditional approach to performance reviews with a look and feel similar to paper-based employee evaluation forms. However, what makes it so attractive is its low price, which starts as low as $1/month per employee—with all these features included. It contains the standard package of performance management tools, such as goal setting, performance reviews, 360-degree feedback, reporting and integrations to other software packages you may be using in your business. In addition to the standard tools, AssessTEAM is built to support newer performance management needs. It provides continuous feedback and employee recognition to improve employee engagement and retention. Its mobile app makes it easy to use by employees and managers alike. In addition, AssessTEAM provides a concierge service to help guide your rollout of performance management to managers and employees in your business. At $1 to $3/month per person, AssessTEAM has the best pricing of all the performance management tools we reviewed. It offers the basic performance management features you’d expect even at its lowest tier, Basic, costing only $1/month per person. By upgrading to the Premium tier for $2/month per person, you get timesheet management and additional project team reporting. That may be helpful if you want to track performance by team and by hours worked, in addition to conducting employee reviews. When you upgrade to the Enterprise tier, you get tools that allow you to track productivity as well as profitability at the individual and team levels. In other words, AssessTEAM lets you manage both individual and team performance, including team productivity and profitability. If you have over 500 employees, you can contact them for custom pricing. The basic features of goal setting, performance management, 360-degree reviews, and reports are included in all tiers of the software. Most small businesses will find what they need, such as a goal library with 900+ job goals, continuous feedback to improve teamwork, and employee engagement. It also has an online dashboard that teams and individuals can use to track performance. In terms of software interfaces, AssessTEAM integrates with most HR/payroll systems using a simple import feature. You then set up key result areas and performance indicators. AssessTEAM also includes a timesheet option, if you don’t already have one. In addition, AssessTEAM has mobile apps for iPhone and Android, project management and 24/7 email support by HR professionals. Other features that make AssessTEAM stand out are listed below. The employee evaluation process makes clear what employees are required to do. It then manages performance in terms of results and key performance indicators (KPIs). Employees can see where they can improve and even compare how they’re doing with others. In addition, the employee evaluation process is so flexible that you can set up evaluations weekly, monthly, after new hire onboarding, after projects, or for any other reason or time frame. AssessTEAM Performance Reviews can be scheduled for any time frame. Like all of the performance review software we reviewed, AssessTEAM provides for 360-degree feedback. But in addition to that, it allows for continuous real-time feedback that can be scheduled as needed, such as weekly in key result areas (KRAs) like office behavior or coding skills. Data is then displayed by person, project or team. What makes AssessTEAM engaging is its real-time data views, the ability for employees to give feedback to their peers, self-evaluations and mobile access. Workers can actually see how their work contributes to the company, team and project goals, including profitability. AssessTEAM interface is easy to use and engaging for employees. The advanced features of AssessTEAM are what make it so powerful at only $3/month per person. They allow top management to do project-level job costing. They can look at productivity metrics in order to identify opportunities for recognition or improvement. AssessTEAM doesn’t have what traditional HR folks might consider standard in a performance management process — goal cascade, where goals start at the top and are passed down to each department, team, and person. Instead, they measure performance by looking at result areas, like targets, budgets, and behaviors. In a sense, this is like using only the M, or measurable part, within in a SMART goal. And that may be exactly what you’re looking for. AssessTEAM gets top-notch ratings on third-party software review sites. In fact, user feedback indicated that they may have cracked the code on simplifying performance management. AssessTEAM is our pick for best performance management software due to both its low cost of entry and its engaging tools that give employees real-time feedback. Zoho People is HR software that’s free for up to five users. If you’re already using Zoho People as your HR platform, adding performance management is a no-brainer. In fact, that’s true for many HR software programs in the sense that they may have performance management modules built in. But Zoho People’s performance management price is so competitive at $3 to $5/month per employee, it’s worth mentioning them as a great platform for performance management in its own right. Zoho People has many modules and interfaces with CRM systems, billing systems, HR systems, and even G Suite. In fact, using webhooks, Zoho People can interface with most systems. In addition, it’s completely customizable, allowing you to turn on or off any features you don’t want employees to use. However, for performance management, the only difference between the Premium package for $3/month per employee and the Enterprise package that costs $2/month more is that the Enterprise package includes multi-rater feedback and 360-degree performance reviews. If you only plan to do standard new hire or quarterly reviews, the Premium package should suffice, and with it, you’ll get an entire HR suite of software. Regarding performance management goals, Zoho People provides the ability to conduct performance reviews. It includes 360-degree feedback and ad hoc performance ratings on KRAs and goals. It also has very robust and engaging reports. Sample performance vs. potential report from Zoho People. In addition, Zoho People has an employee self-service function and mobile apps so that employees can sign in and view their performance ratings at any time. That makes it similar to AssessTEAM, albeit at a slightly higher price point. In addition, either employees or managers can set goals and track progress—a feature AssessTEAM lacks. That makes it feel more democratic than a top-down goal cascade. Similar to AssessTEAM, the performance management application includes time tracking. In a sense, you’re getting a bonus by not having to purchase separate timekeeping software. A view of all the Zoho People performance modules is shown in a screen capture below. We’ll go into detail on the ones that make Zoho People stand out. Zoho People allows you to measure performance against goals in reviews that can be conducted online. Goals can also be created by employees or managers and tracked by both. They also manage KRAs, which you might think of as the measurable aspect of a goal. For example, a goal might be to improve customer performance, but a KRA might be the metric used, such as your net promoter score (NPS). Performance reviews can be scheduled on an appraisal cycle of your choosing, such as monthly, new hire, quarterly, ad hoc or annual. They can include a rating against goal progress and skills and can be weighted. For example, if quality is more important than meeting deadlines, you can assign more weight to the quality rating. As a more modern performance management tool, Zoho People allows employees to rate themselves as part of the performance management process. Weighting of job skills in Zoho People’s performance appraisal tool. A feature that Zoho People offers, that some performance management systems don’t, is a way to track your employees’ skills and competencies. For example, let’s say you launch a project and need a Java expert. You can search your employee database for just the right person with that skill set. Zoho People provides support 24/7 via support tickets submitted online or via email. In addition, you’ll find a robust help function with screenshots and online videos that demonstrate features. You’ll work with the vendor to set up your organization, create (or import) employees and set up your performance management process. If you use G Suite, you can sync your employees directly with Google to streamline data entry and user access. If you want multi-rater feedback and 360-degree reviews, you need to upgrade to the Enterprise pricing tier at $5/month per user. In addition, Zoho People is modularized, so you have to purchase the HR modules to get to the performance management piece. That may require you to maintain redundant HR systems or navigate past features you don’t use. There’s also no phone number you can call if you need support. Zoho People has pretty good ratings from reputable third-party software review sites, including ours. However, their online reviews aren’t as stellar as AssessTeam. Users seem to like the functionality. Negative reviews tend to focus on the modular aspects of the software, it’s complexity, and having to pay for features they don’t yet need. We recommend the entire suite of Zoho products, including Zoho CRM, its IT, Help Desk, Recruiting, Financial Apps and Zoho People because they all work together, giving you seamless business automation. Small Improvements earns our recommendation for customization. But it costs more than AssessTEAM or Zoho People. Small Improvements can be customized to your business’ look and feel, which helps it to be seen by employees as an integral part of their day-to-day work. We also like that it provides a strong foundation for performance management and allows employees to become involved in the process. That’s a great way for small businesses to improve their employment brand. It may be worth the extra few dollars you’ll pay for this tool. Screenshot from Small Improvement’s website. Small improvements is free for 30 days, so you can try it out with your team. After that, it costs $7/month per user, with a $250/monthly minimum (which equates to about 35 employees). Therefore, it’s priced twice as high as AssessTEAM’s highest tier of $3/month per employee. That monthly minimum can be a deal breaker for businesses under 35 employees. The annual total is no less than $3,000—definitely at the higher end as compared to the other performance management tools we reviewed. The silver lining is they provide a 25 percent discount if you pay in advance. And, they don’t require an annual contract, so you’re not locked in. You can cancel anytime. We chose Small Improvements for its high level of employee interaction and engagement. Small Improvements has all the standard performance management system tools built in, including goal setting, performance reviews, 360-degree feedback, and reporting. You can automate the entire process once you are set up, from the reviews to eliciting feedback to setting goals. But where it stands out is with more modern employee engagement tools and feedback. For example, employees can add comments on their own performance, contribute to goal setting and respond to manager comments throughout the year. 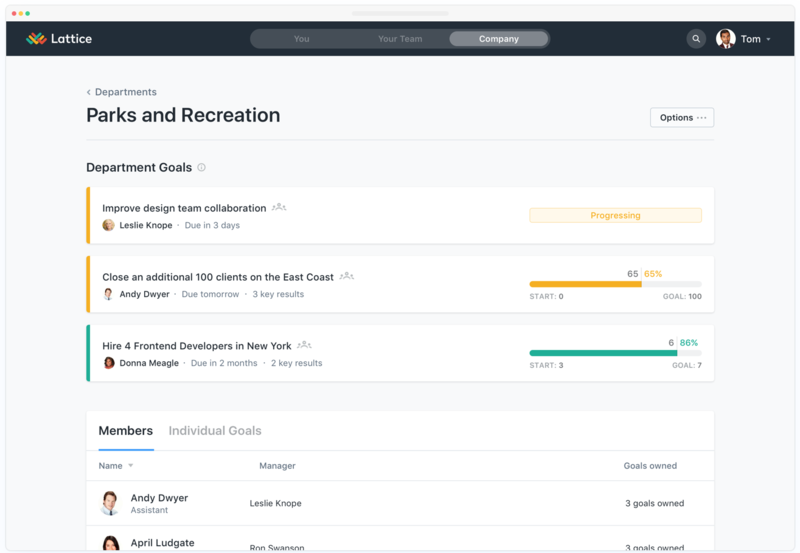 Unlike most performance management software, Small Improvements calls goals “objectives” and lets users track progress towards these objectives throughout the performance review cycle. They provide you with basic review forms and scoring systems to give employees their performance reviews. And they are structured so that employees can be a part of the review process, either informally or as part of a more formal 360-degree feedback performance review. In addition, Small Improvements is customizable, offers single sign-on, and integrates with JIRA, Google Apps, Slack, iCal, and numerous other project management and HR software, such as BambooHR and Namely. Small Improvements offers a unique feature they call Lightweight Continuous Feedback. This feature engages managers not just to give employees feedback, but also for employees to give badges and fun feedback to each other on an ad-hoc basis. One-on-one meetings is a newer feature being offered by performance management systems to address the real-time need for regular ongoing feedback. Within Small Improvements, you can schedule meetings and take notes that can later be referenced when conducting more formal performance reviews. One-on-one meeting agenda and notes are retained with Small Improvements. Small Improvements offers some cool features like peer praise and badges that help employees recognize one another and improve overall employee engagement. 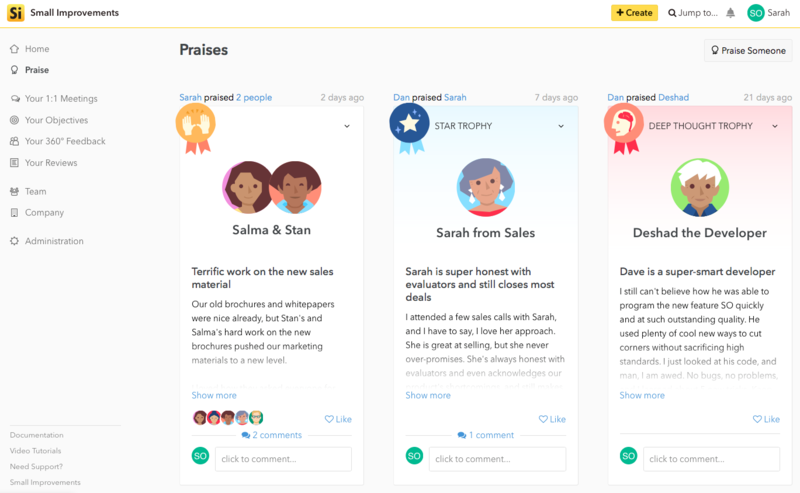 Praise, and the badges employees can earn on Small Improvements. Customer support is free, and Small Improvements will assist with your setup and onboarding. In addition to that, they offer two annual training sessions to help you and your team be successful. Small Improvements appears to be geared toward small businesses that have an HR person on staff to manage the administrative aspects of the software, such as setting up performance review cycles. In addition, the training provided is meant for HR, and not managers and employees. Although the software is intuitive, setting it up may take a bit of time. And, you’ll need to conduct your own manager and employee training when you choose to implement it. Small Improvements receives good ratings, albeit slightly less than Zoho People and AssessTEAM. Users like that they can compare employee and manager feedback side-by-side, and that the application itself is easy for employees to use. We recommend Small Improvements if you’re looking for a full-bodied performance review tool that allows for customization and integrates with other low-cost business applications like Slack and G Suite. Performance Pro made our list of top performance management software as it contains the basic performance management features, such as performance reviews, 360-degree feedback, and goal setting. It’s taken the manual, paper annual performance management process and automated it, providing basic reporting. However, it also includes legal checks, which comb the reviewer’s feedback looking for words and phrases to avoid, so that your performance reviews don’t land your business in a lawsuit. This feature costs quite a bit more; therefore, this option may be best if lawsuit avoidance is on your mind. Performance Pro also has the means to tie performance ratings to employee compensation, similar to Zoho People. That simplifies salary increases and managing pay-for-performance bonuses and incentives. Ensuring that your performance management and compensation systems are fair is a great way to avoid discrimination lawsuits. The pricing for Performance Pro starts at $1,125 a year and is based on a custom quote. That’s about half the cost of Small Improvements’ minimum. Of course, it costs much more than AssessTEAM, Zoho People and some of the others that charge per person with no monthly minimum. What’s interesting about Performance Pro’s pricing is that they offer to beat any competitor’s price by 10 percent, subject to a minimum of $1,125 per year. Given the advanced features they provide, that’s an offer worth investigating. Your exact price will require you to contact them for a quote. 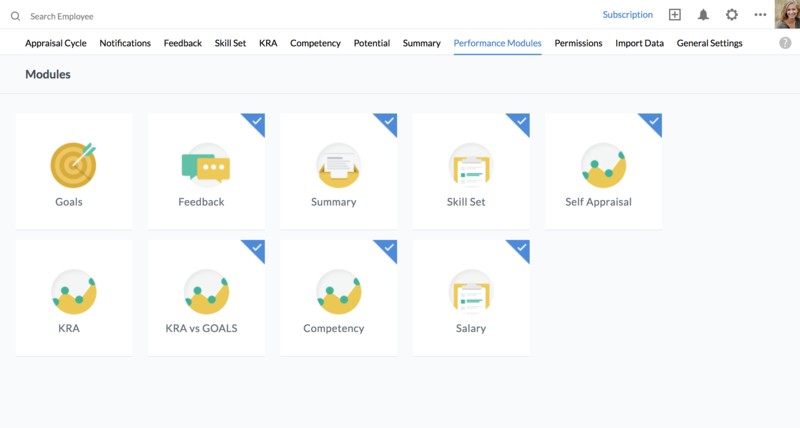 In addition to goal setting and cascade, customizable performance reviews, and ad hoc feedback, Performance Pro has the ability to manage employee competencies and create individual development plans. In that sense, it’s more like a talent management system that allows you to identify and select team members based on their skills. It also offers legal checks to reduce your business liability by flagging words reviewers might use that may be discriminatory or inappropriate. In addition, it can tie performance to employee compensation, and you can set up weights for each score so that you can ensure employees are paid fairly based on their performance. Performance Pro can integrate with most third-party software, but you have to contact them to configure the integration if they’re not already set up to work with that vendor. They currently integrate with BambooHR, SyncHR for HR, and PlanSource for benefits administration. Here are some additional features that make Performance Pro a solid choice if you’re looking for a traditional performance management process that protects your business from legal issues. Similar to Small Improvements, goal setting and the performance review process must be set up by HR as part of the software configuration. Performance Pro sticks to the standard HR model of performance management, which starts by identifying strategic initiatives, setting goals, and then conducting period performance reviews to measure employee progress against those goals. Goals can be weighted. Performance Pro lets you weight evaluation factors and tie pay to performance. Performance reviews can be automated with Performance Pro. That’s useful if your business uses standard time frames for reviews—such as monthly, quarterly or annually. You input the date range for the performance review cycle in order to set it up. Once set up and programmed with names of reviewers, direct reports and forms, emails and reminders can be generated and sent automatically. 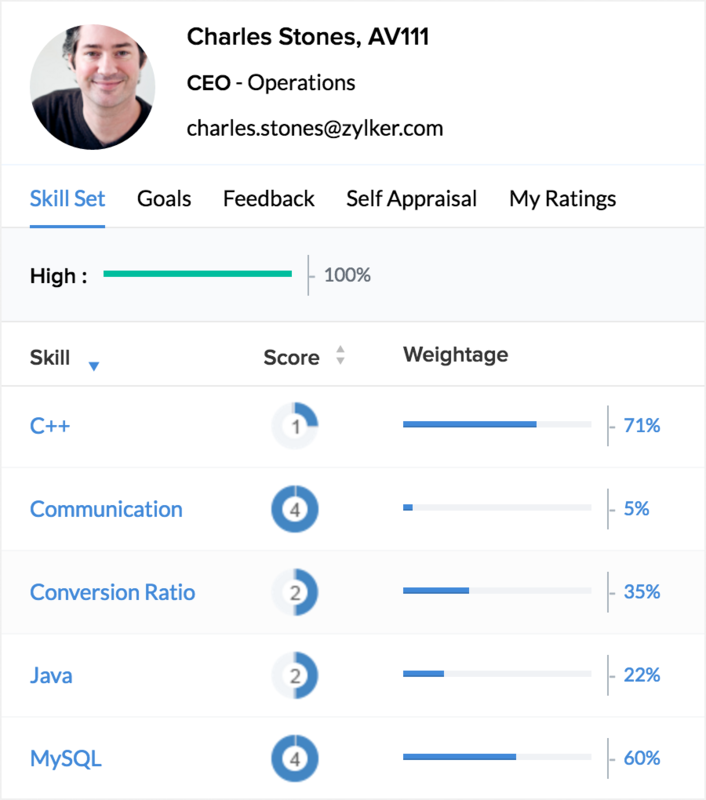 Example of an employee performance review on Performance Pro. Performance Pro provides a writing assistant tool within the software that gives your managers a start at crafting a written review. It also includes legal checks that flag words that may be inappropriate, so they can be modified before being made part of the final performance review. This saves you the risk of a manager documenting derogatory or discriminatory remarks in an employee’s performance evaluation. Customer service is provided over the phone by product specialists in the Midwest working Monday to Friday, 9 a.m. to 6 p.m. EST. You can also request support by email. Performance Pro needs Adobe Acrobat for documents and Adobe Flash Player for scoring review forms. Performance Pro requires a bit of time to set up. You can import employee data from your HR/payroll system. You will need to set up your company information, performance levels, appraisal frequency, goals and factors, and their relevant weights and data for email notifications. A goal library and library of job titles are provided to choose from. Performance Pro has all the features an HR person could want. However, it doesn’t have the employee engagement features of some of the other tools that managers and employees might like, such as real-time feedback or mobile apps. It’s more like a paperless version of a standard performance management process—functional, but not necessarily fun. Users rate Performance Pro slightly above Small Improvements, but not as high as Zoho People or our top choice, AssessTEAM. What they rave about is the customer support. What they tend not to like as much is the interface itself and lack of robust reporting and analytics. We recommend Performance Pro if you’re looking for a customizable, traditional performance management system that covers all the bases, including providing legal checks to prevent issues with your performance reviews. Engagedly doesn’t operate like a traditional performance management system. 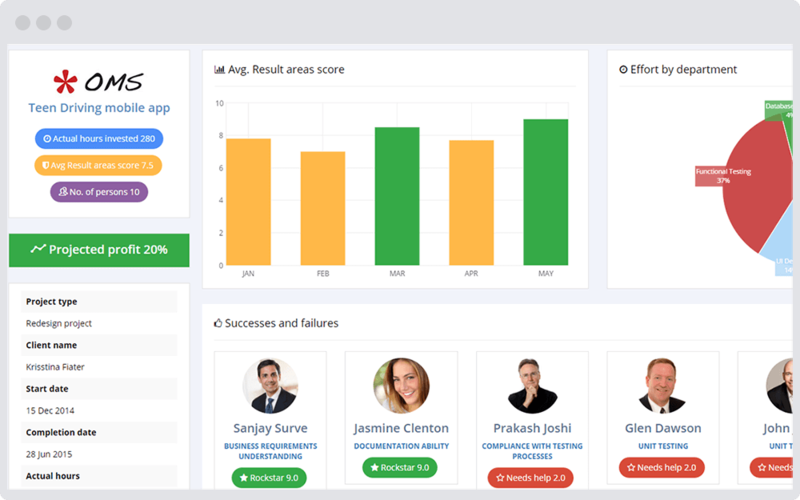 They call it ‘’continuous performance.” It provides peer-to-peer feedback, a cool interface, and a mobile app to provide real-time, ongoing performance feedback to employees in addition to the more standard performance reviews. It’s priced similar to Small Improvement. Team dashboard visible to managers in Engagedly. For performance management, it’s right smack in the middle of the more traditional tools like Performance Pro and the more innovative tools like Lattice. You can create goals and performance reviews. But you can also use its nifty tools for employee engagement like collaboration and communication options. 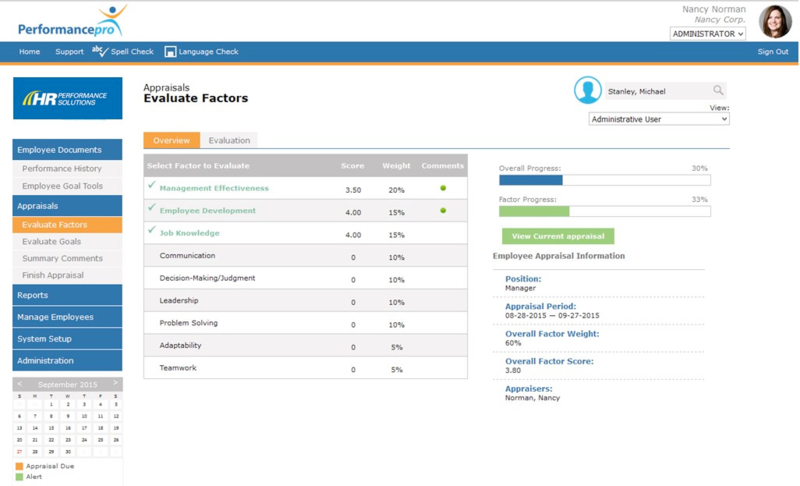 Engagedly has standard and 360-degree feedback performance appraisals. They also have templates for competencies, performance, and job descriptions. They allow for peer reviews. And managers and employees can add notes at any time, not just during the review cycle. In addition, users can attach documents for reference. What makes Engagedly engaging is that employees themselves can request feedback, request a one-on-one with their manager and even send and receive social praise. Engagedly claims that their pricing is transparent, but sources varied on what they were. Prices range from $4 to $5/month per user for Performance Management and $2/month per user for the Employee Engagement tools that include social rewards, shout-outs and gamification. Other sites suggest they require a minimum of $200/month. Therefore, you actually have to contact a sales rep to get an exact price based on the features you want. That doesn’t feel transparent. In addition to standard performance reviews, 360-degree feedback, and goal setting, Engagedly stands out by providing ongoing feedback that’s real-time. Employees can ask for feedback on their work, document one-on-one manager check-ins, obtain recognition from their peers, and even ask for help with what’s termed ‘’social learning.’’ In other words, they can ask questions of and learn from their peers through the system, although it appears that may be an additional cost of $2/month per user. Employees can view their feedback on Engagedly. Engagedly lets you set and track employee goals based on the organizations’ objectives and then distributing the goals to teams and individuals so that they are aligned with what the business is trying to accomplish. Because of real-time feedback, on-going praise and peer input, performance reviews are easy for managers to execute. They can set up custom templates and choose rating scales, measuring goals, KRAs, and even competencies. 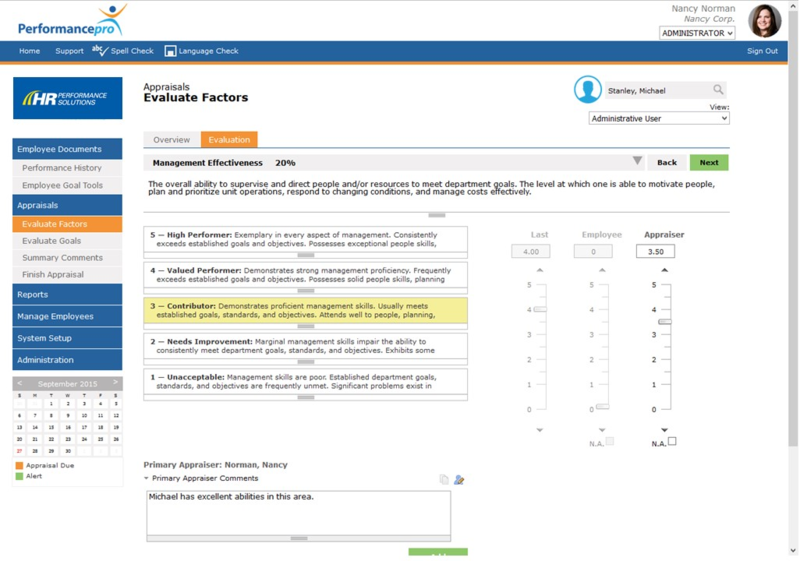 Administrators and managers have a dashboard to keep track of their performance review cycles. Employees and managers can provide feedback, ask for feedback, provide peer recognition and even offer social praise. These tools promote employee engagement. Employees can award points to one another that can be redeemed through Engagedly’s add-on employee engagement software, which lets employees choose gift cards. Examples of badges employees can earn in Engagedly. Engagedly set up is so easy it can be done in the same day, and they publish their phone number directly on their website if you need support. In addition, they provide all documentation online, including webinars, service agreements and step-by-step user instructions with screenshots. The only thing missing from Engagedly is pricing. In this modern area, it’s the rare application that doesn’t tell you how much it costs right on its website. Engagedly is another of the performance management options that gets top ratings on all the standard review sites. In fact, in the Society for Human Resource (SHRM) vendor directory, it received five stars. If you’re looking for your performance management system to engage employees and give them and their managers control over the process, Engagedly is the tool to consider. Lattice falls into the camp of newer, one might say “cooler” performance management tools. It has all the standard performance management features such as goals and performance reviews. Lattice adds one-on-one meetings like Small Improvements and some of the recognition features like Engagedly. It has been designed for the non-HR user. It is priced slightly higher than these other tools. Goals are tracked real-time in Lattice instead of waiting for a review. Its interface is progressive and modern, and it integrates with G Suite, Slack, BambooHR, and SSO as examples, making it appear seamless to your workforce. These integrations mean peers can provide feedback and have it published to a Slack channel. It also means that G Suite users can schedule their check-ins and be reminded through their Google calendar. And SSO means that your employees don’t need to remember yet another user ID and password. Pricing for all-in-one performance management for Lattice is $9/month per employee. That includes all the setup and training, as well as all the features. You sign up for a 12-month contract, and they don’t auto-renew. You get all the features for a flat per-person rate, unlike Engagedly, which appears to charge separately for its performance management versus employee engagement modules. You could also choose a scaled-down version for just $7/month per employee. If you want custom reporting or features, you’ll need to call them for a quote. 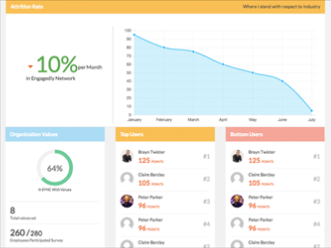 Lattice has all the same features of the other performance management software we reviewed. But, instead of becoming a quarterly or annual event, Lattice is baked into how your employees work by providing ongoing feedback and one-on-one meetings with agendas and documentation that supports work activities. Goals can be set up for departments and groups as well as individuals. They can be set up as SMART goals or KRAs—whatever makes sense for your business. That saves time and ensures alignment. Those goals are then tracked in real-time with team members being able to view their own and their teams’ progress. 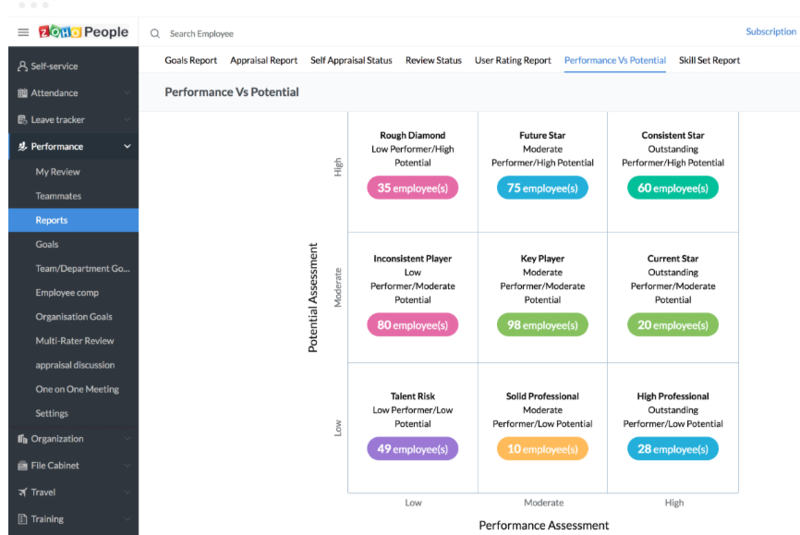 Lattice provides lots of templates to use as a starting point for performance reviews. They can be customized using whatever format you want, 360-degree feedback, manager reviews, self-reviews, and reviews of direct reports. And the review cycles can be run as often as you like. There’s no need to schedule structured review cycles on a quarterly or annual basis. They can be done any time it makes sense, such as after a new hire’s first 90 days, or at the end of a major project. Example of a performance review question on Lattice. 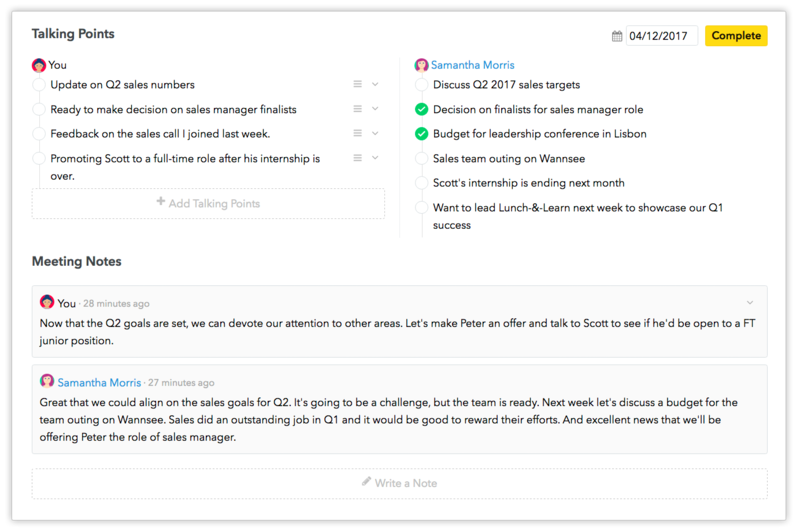 The one-on-one feature in Lattice allows employees to take control, improving employee engagement. Managers and staff can develop agendas, schedule meetings, take notes, and keep track of accomplishments. At review time, or whenever you want to provide feedback, these notes are available within the system. No more emails back and forth! 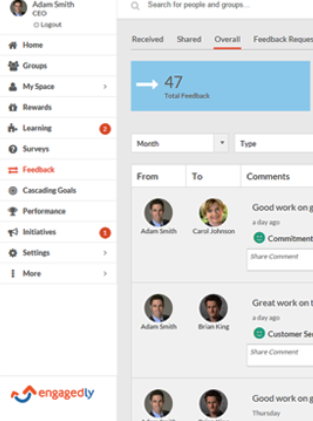 Lattice provides a ‘’praise wall,’’ where feedback can be shared for all employees to view. Feedback can also be published to Slack, so that employees receive the benefit of peer accolades. 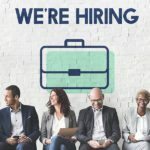 This employee engagement feature is unique to Lattice and is a reason that it’s more likely to be used by managers and employees. It’s real-time. It’s fun. Setup is free and takes just a few minutes. You upload your employee list from a CSV file and invite users to join. Then you can verify everyone has been set up by viewing a simple org chart. They provide an easy setup, including allowing you to upload employee data with a CSV file that requires only eight employee data fields—like employee name and email address. You can also opt-out of the software within the first 30 days if it doesn’t fit. Although Lattice has an aggressive roadmap, they’re a relatively new player in the performance management arena, having been founded in 2015. Therefore, they don’t yet have a mobile app, for example. Lattice is right up there with top ratings on review sites. Users like how the process is streamlined and the interface is uncluttered. Employees and managers like how easy it is to use. Users found the customer service team extremely helpful. However, some customers mentioned they would like to see more integrations to other apps. Lattice provides the entire performance management system in one package, from traditional reviews to one-on-one meeting notes captured real-time. It also includes must-have employee engagement tools to motivate your employees to peak performance. Many HR software providers, like Zenefits, and BambooHR, or payroll vendors like ADP, have added performance management tools into their standard HR suite. In fact, Zoho People, featured above, is designed in just this way. Therefore, you may want to check with your existing HR/payroll provider to see if they have performance management tools available within the software you’re already using. However, you may wonder why many of these newer performance review tools interface with HR software if the HR software already contains performance management features. Often it’s because the tools designed specifically for performance management do more than their HR counterparts. For example, they provide sample goals, legal checks and/or employee engagement tools. Due to recent research, and the movement away from formalized annual performance reviews, some companies have chosen to streamline their performance management system and provide a more democratic approach to performance feedback. 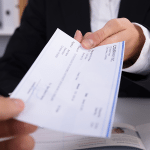 For instance, some of the alternatives below provide a means for employees to provide feedback and cash bonuses, points or badges to peers, in addition to standard performance feedback and employee review forms. If you’re not ready to invest in a stand-alone performance management tool, you may want to consider some of these alternatives instead. BambooHR Full-service HR with mobile self-service performance reviews. About $8/month per employee. Bonusly Peer-to-peer employee recognition with mobile and gamification for $3/month per employee. 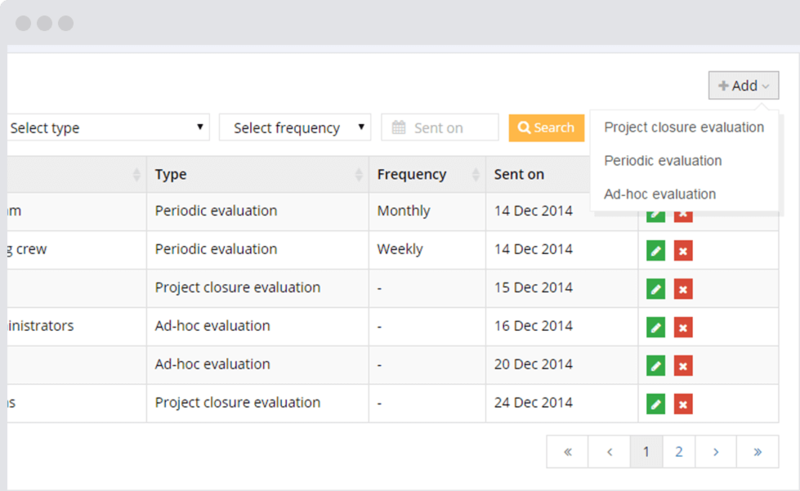 OrangeHRM Open-source HR software with performance management features. PeopleHR Performance management for businesses outside the US. About $6/month per employee. SmartSheet Downloadable, editable Excel-based templates starting at $14 per month. Zenefits Performance management as part of an HR suite, about $4/month extra per employee. Have a question about choosing the right Performance Management System for your business? Our analysts are standing by to answer! Performance management is changing, from the ubiquitous annual review to more frequent feedback, such as quarterly or on-going. It’s also now more common to obtain feedback from others besides the employee’s manager. That means the performance management systems are changing as well—now including peer reviews and feedback from multiple sources. What works best for your company and your culture is a system that supports how often and who exactly provides employee performance feedback. It’s nice to get an all-in-one package like Zoho People that provides both HR and performance management at a great price.